(VOVWORLD) - VOV President Nguyen The Ky and Deputy Minister of Foreign Affairs Vu Hong Nam co-chaired a meeting in Hanoi on Friday with ambassadors and heads of Vietnamese representative agencies abroad for the 2018-2021 term. Mr. Ky said as a multi-media agency , VOV has 11 overseas bureaus and many external information channels. VOVWorld or VOV5, which broadcasts its programs in 11 languages, and the television channel VTC10 have disseminated the Party and State’s infomation to the world. 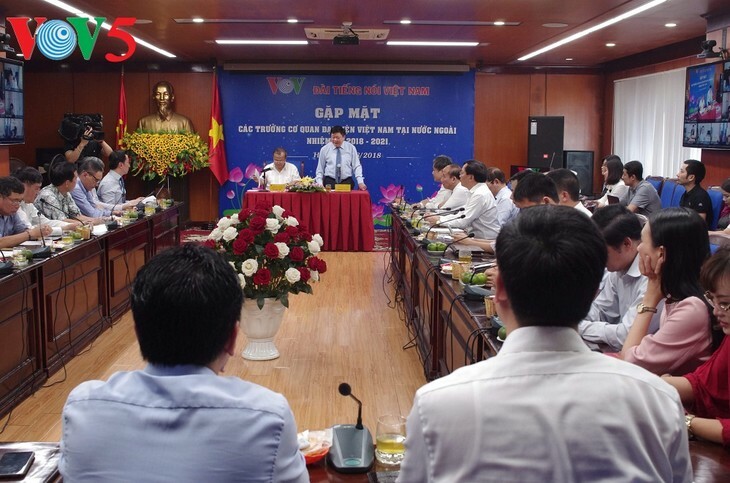 VOV President Ky said he hopes ambassadors and heads of Vietnamese representative agencies abroad will create the best conditions for VOV reporters to fulfill their missions. Deputy Foreign Minister Nam, who has recently been appointed Vietnamese Ambassador to Japan, praised VOV’s development over the years and pledged to stand side by side with VOV in informing the world public.